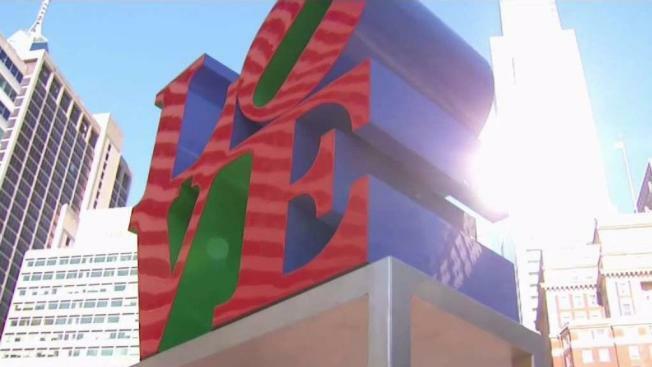 Philadelphia held an official ribbon cutting and grand opening of the redesigned LOVE Park at 15th and Arch streets in Center City Wednesdaymorning. The $20-million of upgrades were first revealed when the park reopened in time to host the Christmas Village last holiday season. LOVE PARK, officially named John F. Kennedy Plaza, was upgraded over a couple of years. Robert Indiana’s iconic LOVE statue even was moved out of the park for a time. But the statue, with a fresh coat of paint, is back and so is the fountain but it will now light up with color when it is officially turned on Wednesday. The possibility to marry in front of the LOVE statue and new places to eat are just a few of the features in the new and improved version of Philadelphia's LOVE Park. Talk about love, there is something else new coming to the park: a handful of wedding permits will be given out by the city, a parks and recreation spokesman said. There will also be food trucks and festivals hosted in the park in the coming months. One aspect of the new LOVE Park, which features grass and plants that lacked in its previous form, which isn’t ready yet is the new visitor’s center. Construction on the center featuring a restaurant and restrooms continues as the city hopes to have it be ready by the fall. Critics say the new LOVE Park lacks the grunge and grittiness that helped make it an international skateboarding destination over the years while others say they appreciate the new, greener, park.